Sea Watch® makes enjoying seafood simple and fun! Tender clams from the cold North Atlantic bring the delicious taste of the sea to your table. 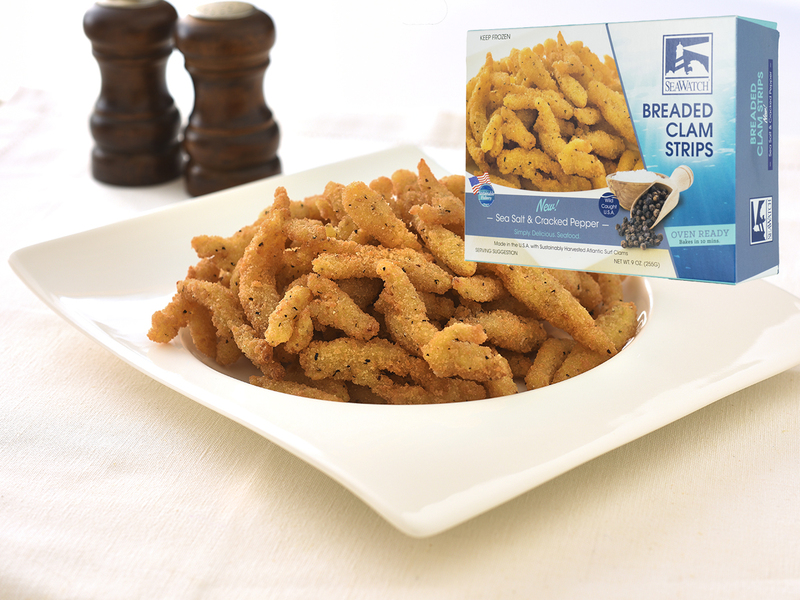 Sustainably harvested by generations of local fishermen, our tender breaded clam strips, seasoned with sea salt and cracked pepper, deliver a savory, crispy finish! Oven-baked or fried, they’re ready in minutes for tasty snacks, to fill hearty clam rolls, or as a delicious protein on your healthy salad. Of course you could bake them in the oven but they never had that awesome combination of Tender and Crispy that you get from the old deep fryer. Now you can get that tender crispy crunch from the oven. Through Sea Watch’s revolutionary process, the performance of the Oven Ready Sea Salt & Black Cracked Pepper Clam Strip has equaled that of a fried product and in some cases been preferred. Sea clams have been under federal management since 1977 and is considered by many to be one of the best-managed fisheries in the world. Cook until an internal temperature of 170˚F is achieved. Preheat oven to 400˚F. Place frozen strips in a single layer on baking sheet lined with crumpled aluminum foil. Bake uncovered for 8-10 minutes. Fry from frozen at 350˚F for 60 seconds. Microwave is not recommended. Do not refreeze. Ingredients: Sea clam meat and sea clam juice, wheat flour, water, yellow corn flour, salt, wheat starch, sugar, leavening (sodium acid pyrophosphate, sodium bicarbonate), spices, yeast, guar gum, nonfat milk, eggs, spice extractives, sodium tripolyphosphate (to retain moisture), modified cellulose, enzymes, dextrose, yeast extract.